You have seen roadblocks, whether around town, on TV, or in the movies. No one ever seems too pleased about them. Police departments conduct roadblocks in their effort to keep unfit drivers off the roads and for crime control purposes. The intrusion to drivers is usually minor, but sometimes the procedures for the roadblock are not followed properly, resulting in an illegal roadblock. 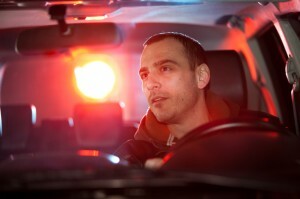 However, fleeing or veering away from the Georgia DUI Roadblock can make things worse. An officer may suspect a driver of evading a roadblock by viewing a driver making an abnormal maneuver to avoid a DUI checkpoint. You are driving along down the road and you come across a sign or other signal that there is a Roadblock ahead. You may also see police patrol cars with their lights flashing. Whether you are sober, or had a couple drinks at dinner, this can be intimidating. Maybe you have nothing to hide, but you just do not feel like waiting to go through a Georgia DUI Roadblock. So, in a split-second decision, you may make a sudden turn around or onto a side street to avoid going through the roadblock. Moments later, you see a patrol car’s lights behind you and directing you to pull over. You have just been stopped for evading a roadblock and are now potentially in a worse position than if you had stayed on your original path. The officer may have stopped you because he had a reasonable belief that you were attempting to avoid the roadblock, and that perhaps there is some criminal activity that you are trying to hide. Normal driving would not have caused the police officer to have suspicion about you, but your sudden turn was abnormal and caught his eye. See Terry v. State, 283 Ga. App. 158 (2007) (the defendant saw a roadblock ahead, suddenly turned into a closed business parking lot, and turned around to drive off in the opposite direction, and a police officer suspected that the defendant was taking evasive action to avoid the roadblock). When an officer has a particular suspicion about a driver, he can make a valid stop to investigate the driver further to make sure the driver is fit to operate a vehicle on public roadways. It is important to note that drivers who are caught attempting to evade a roadblock do not enjoy the same constitutional protections as those drivers who are seized and searched going through the roadblock. If a police officer has a reasonable, articulable suspicion that a driver is attempting to evade a roadblock, then the officer may pursue that driver and pull the driver over. Any abnormal or unusual driving behavior may lead the officer to have a good faith suspicion that a driver is being evasive. Jones v. State, 259 Ga. App. 506, 507 (2003), citing Taylor v. State, 249 Ga. App. 733, 735 (2001). Examples of evasive driving behavior includes pulling over to the road side before the roadblock, making an abrupt or sharp turn or stop onto a side road, turning suddenly without signaling, turning into a closed business, or making any illegal turns away from the roadblock. In the Jones v. State case, the defendant saw the roadblock ahead and he came to a sudden stop, improperly backed up his vehicle on a one-way street, and made a left turn onto a side street; this unusual and illegal maneuver caused the police officer articulable suspicion that the defendant was attempting to evade the roadblock. Similarly, the defendant in Taylor v. State saw a roadblock, slowed down as if he were preparing to stop, suddenly turned onto a side road, and then drove over a curb into the parking lot of a closed business. However, a mere police intuition or hunch that a driver is attempting to dodge the checkpoint is not enough. Jorgenson v. State, 207 Ga. App. 545 (1993). In the Jorgenson case, the defendant did not display any illegal or improper driving maneuvers, but the police officer acted on his personal belief that the defendant turned into an apartment complex where he did not live, based on the defendant’s car and the quality of the apartment buildings. The police officer did not have any particular reason for suspecting the defendant of evading the roadblock, so it was unlawful for him to stop the defendant. Consequently, the court held that it was a violation of the defendant’s Fourth Amendment rights. Indeed, there are many signals to a police officer that a driver may potentially be avoiding a roadblock. Nevertheless, a proper and legal stop, turn, or U-turn will usually not rise to a sufficient level of suspicion for police officer’s to stop you. See State v. Hester, 268 Ga. App. 501 (2004) (the court ruled that the defendant made a legal U-turn and there was no reasonable, articulable suspicion for the police officer to stop the defendant). The general rule is that normal driving that incidentally evades a roadblock does not justify an investigative stop. Jones v. State, 259 Ga. App. 506, 507 (2003), citing Taylor v. State, 249 Ga. App. 733, 735 (2001). Therefore, if you believe that your Fourth Amendment rights have been violated at a roadblock stop, you should contact a Georgia DUI Attorney immediately. Anne Bishop is well-informed on the proper police procedures when it comes to roadblock checkpoints and can help determine if there are any challenges to make on your case. Georgia Criminal Defense Attorney, Anne Bishop, welcomes questions on Criminal Defense and Georgia DUI laws. Please Call or Email us about any questions you may have about GA DUI laws in Georgia and please remember your initial consultation is free of charge.